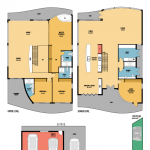 I specialize in creating high-quality floor plans for real estate agents, property managers and developers. If you have amazing skills, we have amazing Jobs. Cadhauz has opportunities for creative professionals and empowers you to work with like minded individuals in a safe environment.